I've kept up pretty regularly with my baking over the past few months. Although baking bread is something I've worked with in the past, I've never really committed to it, like with making cheese or brewing beer. But as my doctor continues to advise me to avoid alcohol while I finish up another round of medication, I've had more time to focus on baking bread. But the two really are not so dissimilar, which is part of the reason I've gone so gung-ho into bread making. 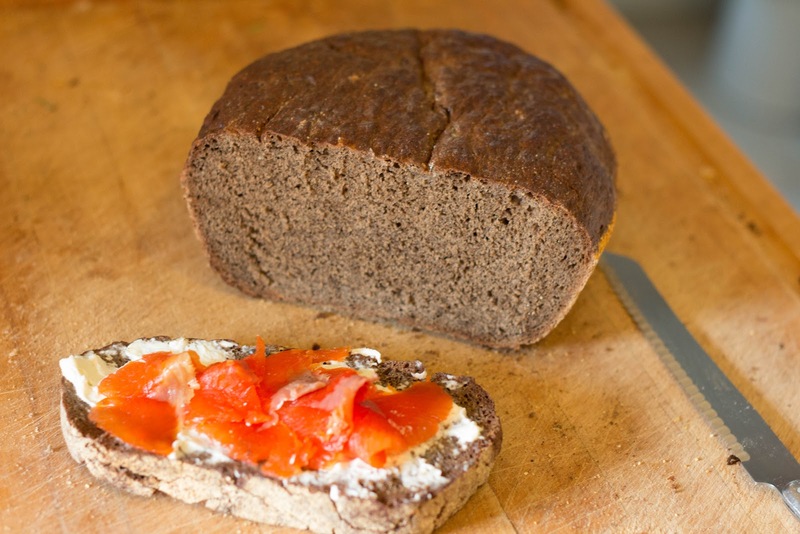 Both brewing and bread making can be simple and straight forward, using plain grains, fermented with a basic yeast, and turn out pleasing results quickly. Or you can start using more unusual grains to add more dimension to your beer or bread, such as rye, oat, or even grains like millet and amaranth. Then there's the yeast, you can use a plain yeast, or a more robust yeast to result in a stronger beer or a more full-flavored bread. You can cultivate wild yeasts for lambic style beers or sourdough bread. And on and on. - English Bread and Yeast Cookery by Elizabeth David. This is a huge (500+ pages) book, but incredibly readable and nothing feels superfluous. Elizabeth David takes you through every step in details, cites every source in detail, and still comes off as a very fun and engaging writer. -Beard on Bread by James Beard. A much slimmer book, but really helpful and I found this to be a great starting point. And you have to love James Beard's candid style. He totally messes up a recipe ("Broiled Loaf"), but it still sorta works, and he includes his mistake as a great point on how sometimes mistakes can lead to interesting and delicious results. - Adding sugar to a loaf of bread can slow down the rising time, as the sugar will pull water from the yeast, making them work slower. - Honey, which has antiseptic qualities, will slow down the yeast even more. - Traditional "soft" flours (with low gluten), like barley and oat flour, were used to make griddle cakes or crumpets in English and Welsh homes. The batter would be so wet you would "knead" the bread by whisking it for 10 minutes to help develop what gluten there was. - Although white flour was prized for its purity and delicate taste, it also gained widespread acceptance because of its keeping qualities. With the bran and germ removed, the flour wouldn't have any oil, and could keep from going rancid for up to two years at room temperature. - Victorians prized a pure white loaf, but when making a sweet loaf seasoned with saffron, it was noted you should leave the saffron stamens in, so your guests would see them in the bread and know how much money you spent on them. Kind of like seeing real vanilla bean seeds in ice cream or creme brulee today. - Sourdough breads also "keep" longer than most, as the acidity of the sour leavening culture inhibits the growth of mold. - In centuries past, most bread making was done with either wild yeast, as in sourdough, or a housewife would go to the brewery and buy a pint or quart of yeast dregs. Then she would pour the yeast in cold water and let it sit overnight to rinse out the bitterness of the hops. Commercial fresh yeast, called "German yeast," was actually very hard to come by and slow to catch on.